Thumbtack.com is a website that is transforming the way people accomplish any project, anywhere, anytime by quickly delivering customized quotes so you can compare pricing, read reviews, and hire the right professional on the spot. The main purpose of Thumbtack is to connect millions of customers with qualified independent professionals. Highlighting the highest quality and most trustworthy professionals is Thumbtack’s goal. To do this, they give priority to professionals who have completed their profile and who have demonstrated their trustworthiness through identity verification and background checks, and who have taken the initiative to reach more customers. 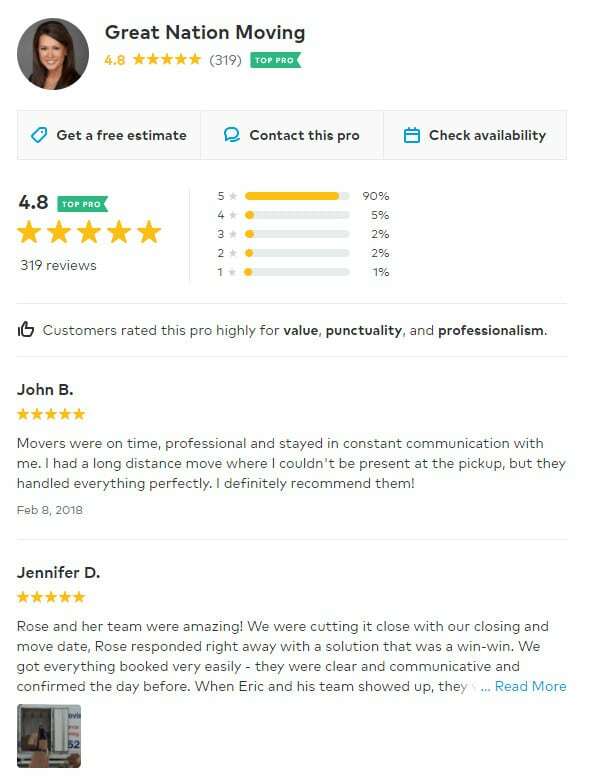 Great Nation Moving is a proud owner of the Thumbtack Gold Profile badge and a 4.8 (out of 5) star rating, currently based on 319 reviews.